I’ve completed my first week in Ethiopia. I’ve spent most of the time working with the ecbp team behind the project. This week, we have been preparing laptops for distribution and have completed the first round of teacher training at a local school. It is difficult to appreciate just how simple this school is. The classrooms are bare, with nothing more than desks, chairs, a blackboard and sometimes a sink. It will be an interesting contrast to see children using high-tech XO laptops in this environment. I never know what to comment on when people ask for my opinion on the area. My hotel is in a newer part of town, on a busy road. Blue-and-white taxi buses fly past, breaking every rule of the roads that I’m used to, with someone hanging out of the window shouting out the destination. Many vehicles are old and the petrol fumes are a little unpleasant, and combined with the light air at this altitude it is hard to get used to breathing while on the road-side. Ethiopian children swarm around you, trying to sell chewing gum and clean your shoes. The local food is nice, and extremely cheap, but a bit too much of the same to have all the time. There is more industry here than you might expect, but I think it is heavily propped up by foreign aid. 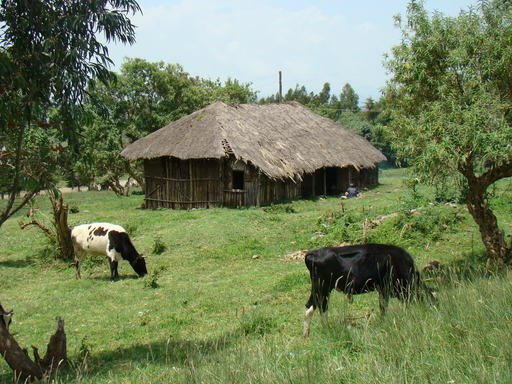 During a conversation with a local about the country in general, he made the amusing remark that he views Ethiopians as lesser successful than people in the west because Ethiopians are generally lazy and get nice weather all the time! Amharic is an interesting language. Thanks to a patient coworker, I’ve picked up some basic phrases, can count to 39, and have acquired some basic understanding of the Ge’ez alphabet. Vowels only exist as suffixes to consonants, so there is a nice mapping from written form to pronounciation. Other interesting differences include the calendar (it’s new year 2001 in Ethiopia, and there are 13 months in a year), and the time system (00:00 is sunrise, not midnight). Sometimes I don’t know whether to believe the people who tell me this! After spending almost all of my time working this week, I ventured out today and saw some more of the city. It was interesting to see the older districts, more typical of the area. I confronted my fear of the aforementioned taxis (assisted by a friend!) and practiced my minimal Amharic. On Monday, I will visit a school a little out of town. I’ll be observing the teacher training, then I’ll assist with Wednesday’s deployment of 650 laptops to the students. 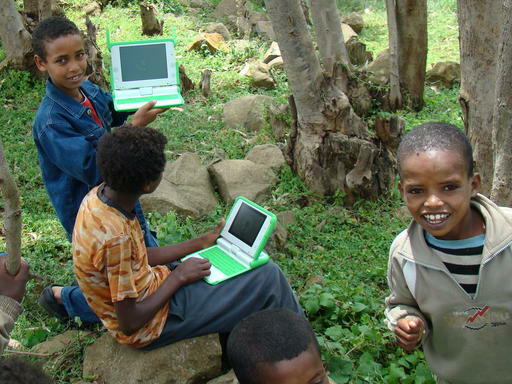 On Friday, I’m heading to Ethiopia to work with the local OLPC team for a few weeks. I’ll be educating them on technical matters, encouraging and equipping them to become further involved with project development, and I’ll assist with the deployment of 5000 XO laptops to schoolchildren. These laptops were donated through last year’s Give One Get One US/Canada promotion. 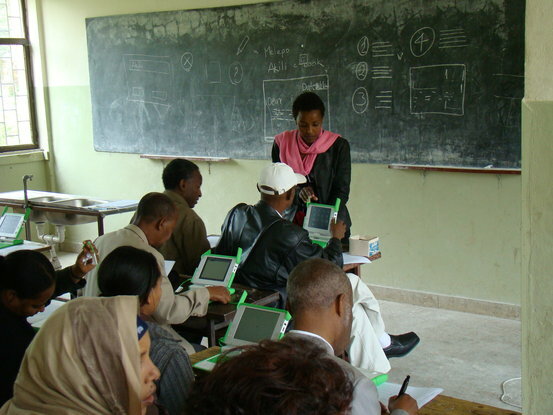 I also plan to visit the OLPC efforts in Rwanda. I’ll be back in the US in mid-October and will return to the UK soon after. I spent some time this weekend at the OLPC Physics Game Jam. I teamed up with the legendary Nirav Patel and we made a bridge building game. The objective is to build a bridge and see if it survives after a train starts travelling across it. We only have one level so far, but it is quite engaging and not as easy as it might sound. It was interesting to see some youngsters try it and experiment with different bridge structures during the review session. The game also features some top notch sound effects coordinated by Brian Jordan. We won the gold prize for game development. To learn more and download it, see the Bridge page on the wiki.